This field guide provides detailed instructions for engaging and building sustainable and competent partnerships with faith communities throughout the entire disaster lifecycle. It is accompanied by a Religious Literacy Primer. Published by the USC Center for Religion and Civic Culture and the National Disaster Interfaiths Network, the two tools serve as accessible guides to help government agencies and non-profit organizations enhance their religious literacy and engage with faith communities during unsettled times. The current American religious landscape is more complex and diverse than it has ever been in the past. 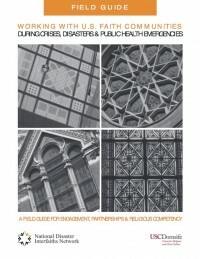 The Field Guide provides suggestions, best practices and guidance on how to approach the faith communities, religious leaders and faith-based non-profits that make up this landscape to build durable, institutional relationships and develop sustainable, faith-based emergency preparedness and response programs. Both the field guide and religious literacy primer trace their origins to three turning points in recent U.S. history: the 1992 civil unrest in Los Angeles, the terrorist attacks of 2001 and Hurricane Katrina in 2005. Faith-based responders and civil authorities all rose to meet these challenges, but in each instance the need for greater coordination and collaboration among a wide array of responders became apparent. Accordingly, the publication of the Field Guide and the Religious Literacy Primer is the result of an unprecedented collaboration among faith partners—Catholic, Protestant, Jewish, Muslim and Buddhist groups were represented at an event to launch these resources—as well as emergency management personnel from local, state and national levels. Thus, in addition to providing essential information to governmental first-responders, the Field Guide and Religious Literacy Primer are also invaluable tools for congregations that want to integrate themselves into the growing network of faith-based and civil first responders. “Nothing like this gets taught in seminary,” said Peter B. Gudaitis, M.Div., president of the National Disaster Interfaiths Network. “You have to learn it later on your own.” Helping other faith leaders to acquire the know-how to be effective responders–and to integrate their efforts with the work of government agencies–has become a life’s work for Gudaitis, who has over 25 years of experience in chaplaincy, disaster emergency management, faith-based philanthropy, program management and social services administration. Since the mid 1990s, when responsibility for community resilience began to devolve from the federal government to state and local authorities as well as non-governmental organizations, faith-based groups have increasingly been called on to fulfill the promise of compassionate social engagement that lies at the heart of every spiritual tradition.